We sometimes come across an item that we have no idea what it is or what its' purpose could be. Pictured below are examples. If you can identify any of these, please send us an e-mail with the details. 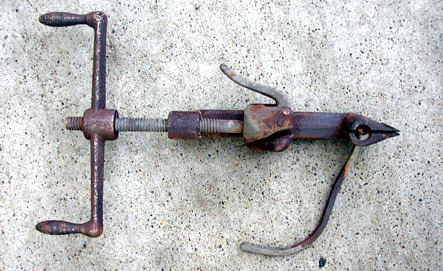 According to Dwight Solt of AEP in Conesville, OH this is a banding tool used to apply banding straps to something. The screw handle is used to tighten the banding material and then you bend the tool to crimp and cut the banding.